ICAR AIEEA 2014 examination is conducted in two streams: Stream A & Stream B.
ICAR – AIEEA examination for entry into Agricultural Universities under the control of Indian Council for Agricultural Research is going to be held on 12th April 2014 at 49 exam centres across India. This examination will be held offline (Pen and Paper Based) and candidates are to be provided with OMR sheets for answering the questions. There are two streams of examination i.e. 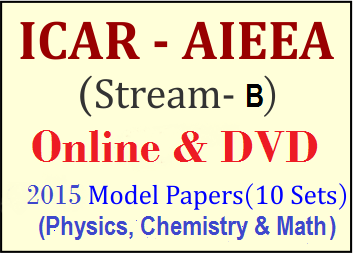 Stream A and Stream B.
Entranceindia provides model papers for both the streams of candidates. Each of our model papers covers 180 questions of 4 marks each. Candidates can appear Physics, Chemistry, Mathematics/Biology separately. For each correct option there shall be 4 marks and each incorrect option shall carry 1 negative mark. For details click here. There is also free Sample papers for registered candidates. There are two sample papers comprising of mathematics and biology separately. Physics and Chemistry questions are common for both the streams.